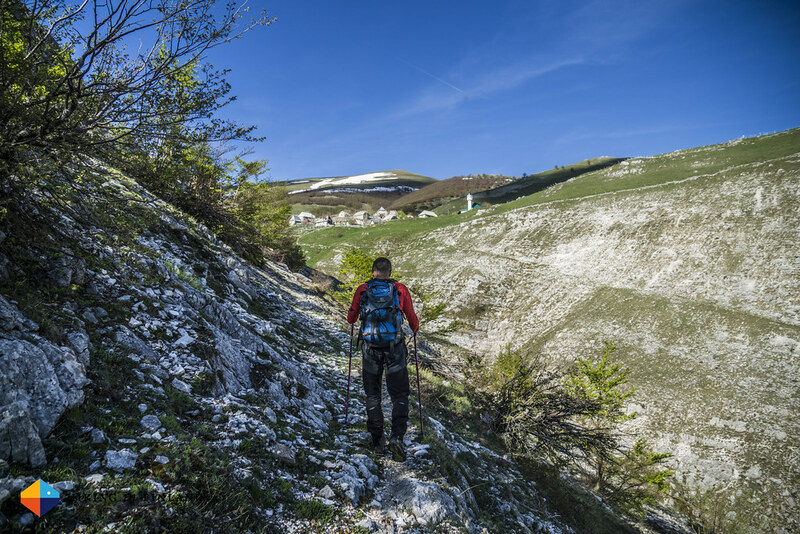 30°C Sunshine, 3.000 m of ascent and 30 km of ridge walking - a good day on the Via Dinarica! After a leisurely day of hiking on snow it was time for some serious distance and ascent today. The day started at six o’clock because we hoped to avoid the 30°C heat during midday and be already in the shade of the forest up on the ridge by then. 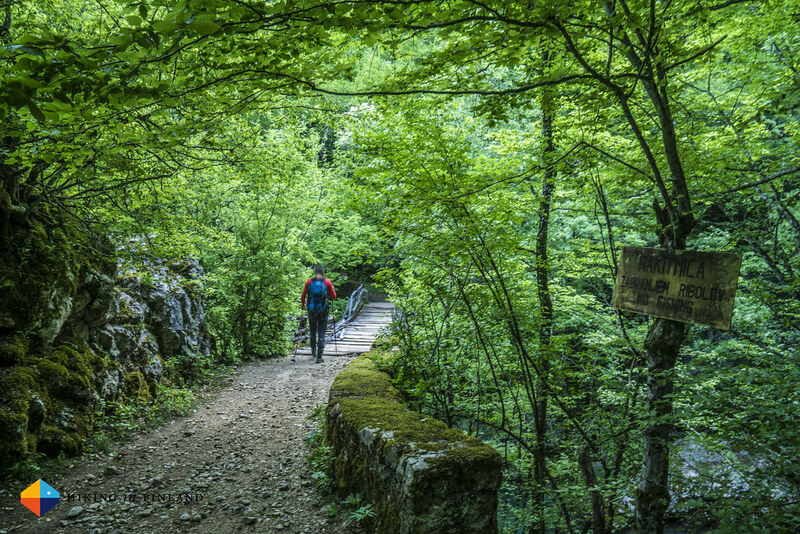 We crossed the bridge over the Rakitnica river, which has created here one of the deepest canyons in Europe, and encountered kids on their way to the school bus and who looked at us with a smile on the face - why would someone hike here at such an early time they likely were thinking. We pass a few houses and soon are on a narrow trail which weaves through the forest, with the river always in earshot. We cross another wobbly bridge over a turquoise river, fill up our bottles at a spring and cross a meadow with a lonely hut on it before we start our ascent up to the ridge. The thermometer is already at 30°C and the sun shines from a cloudless sky on us - it’s gonna be a hot day. 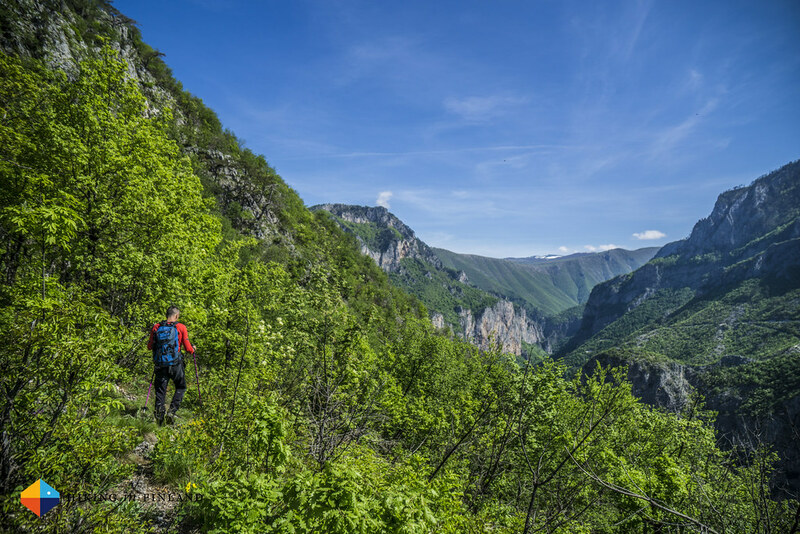 We follow the steep and overgrown trail up to the ridge, and on the other side it is two shoes wide and drops several hundred meters down to the river. The view is gorgeous - we see the complete ridge which we will be hiking today in front of us. 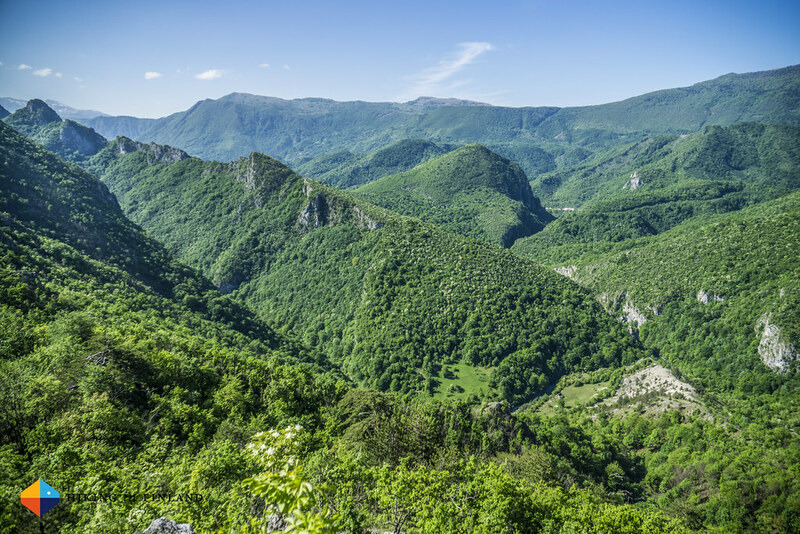 The trail slowly weaves through the shrubbery towards the Dubocani village, and at some point we reach a forest road above Dubocani. It is lush and green down there in the village, the red roofs being a stark contrast to the green meadows. Behind it is the next hill we need to climb. 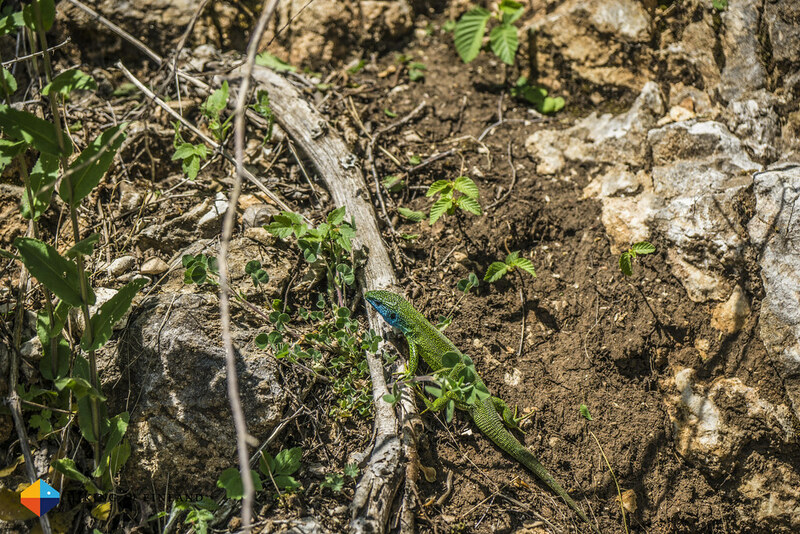 We follow the forest road and colourful lizards run into the undergrowth as they hear us approach, so fast that it is difficult to snap a good photo of them. Over a soft trail of old leafs we climb the hill, refill our bottles once more at a spring next to a Shepard who tells us that his two sisters are living in Helsinki (!) and then climb further up. By the time we reach the top and start of the ridge my water bottles are empty again, and refilling them at a cistern full of death insects and dirt is somehow sub-optimal without a filter. After a break we start our second ridge walk of the day - mostly in the hot sun, occasionally in the shade of the forest. It is so hot that I seriously question why I decided to wear the Rab Calibre Pants which were great for the snowy and coolish weather on Prenj the previous days but are way too hot for this kind of hiking. 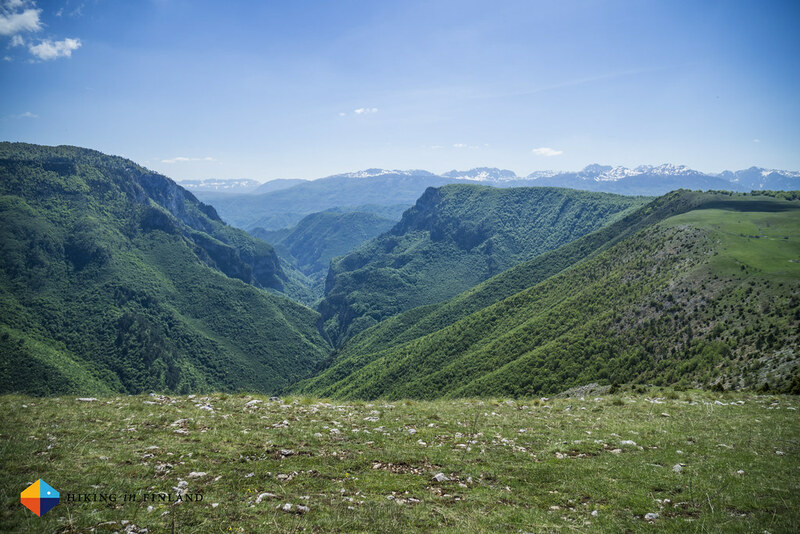 But I don’t want to hike in my boxer shorts, and so we continue, kilometer after kilometer, hour after hour, always with the turquoise Rakitnica river to our right down in the canyon. 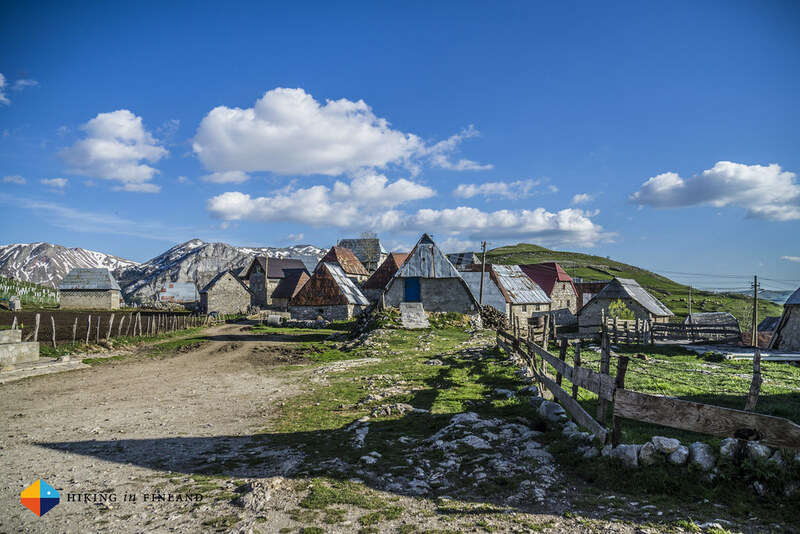 We pass a bombed down village from the war where nowadays only Shepards life with their sheep, then climb another 400 m hill and still have many kilometers to go. I am so thirsty but don’t want to drink the “dirty” water from the cistern, but after a few hours in the heat I can’t take the thirst anymore and drink the litre in one go. 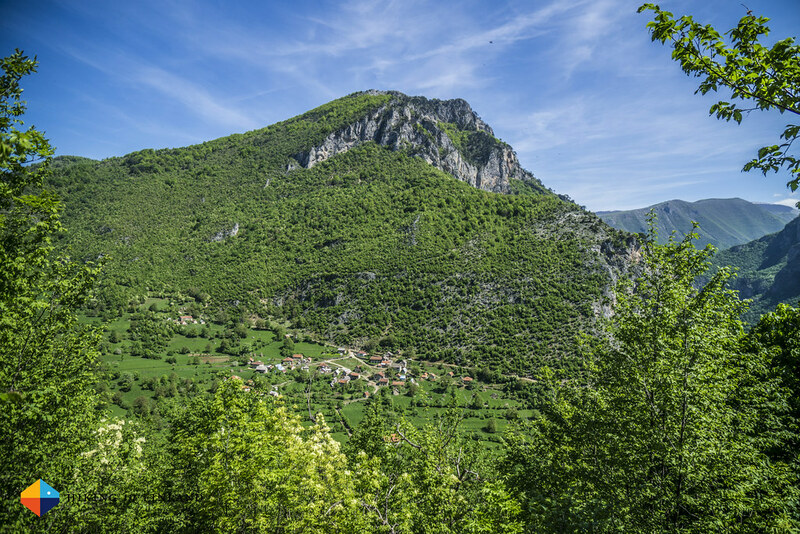 We bushwhack up an hill with a 200 m drop to our right, and then finally come onto the path which will take us to Lukomir, the most remote mountain village in Bosnia and Herzegovina. I somehow am refreshed by the thought of soon being able to drink some clean water and wash my face in a cool fountain. The trail contours the mountain and after a bend we can see the minaret of the Mosque of Lukomir up ahead, and the sound of a cool stream is echoing from the hills. We walk through the old, traditional village and head for the fountain, where I gulp down a litre of cold water in one go. After that Kenan and I sit down in the Café and I enjoy a tasty coffee, while we wait for our ride to the nearby Restaurant & Pension Umoljani Bjelašnica. The trail to the B&B would have been short and easy Kenan tells me, but after a 30 km day with over 3.000 m of ascent and plenty of heat I am so knackered that I am happy to drive in the car there. As we arrive late in the evening we are welcomed by the owner who cooks us a tasty dinner - all ingredients are locally sourced. Full and happy I stumble to my soft bed, put my alarm on for another 6 o’clock alpine start, and fall soundly asleep. 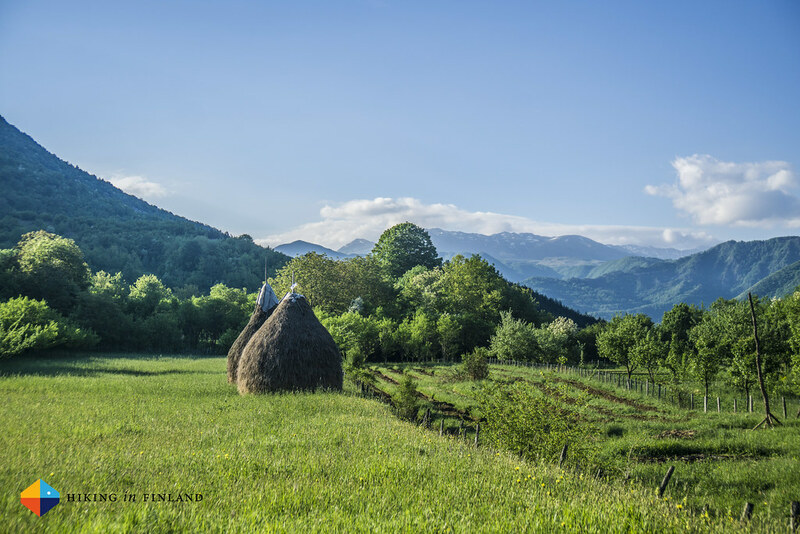 The defining memory of the day is not the heat, the sun, the fine hiking, the cold fountain in Lukomir, the old huts and tasty Bosnian coffee or even the utterly delicious food in the evening, no, it is the smell of Herzegovina that I was breathing in and out during the early morning. 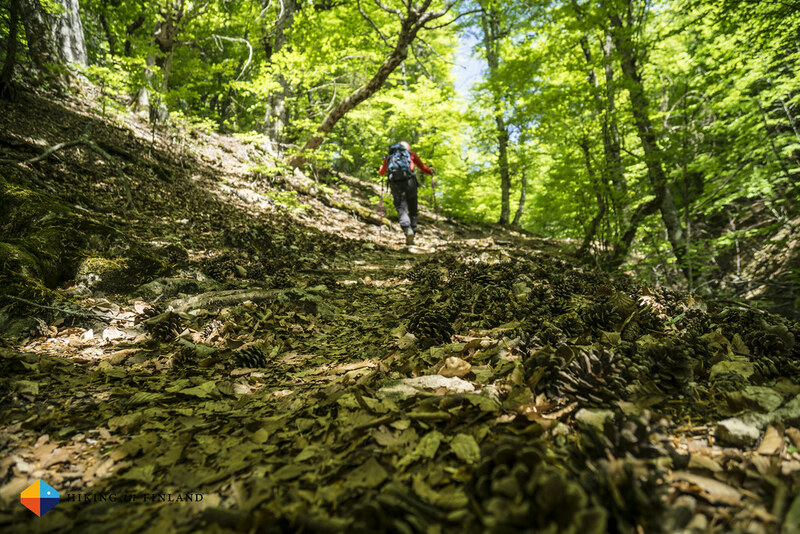 The dry, sweet and warm smell is a mix of the earth, flowers, water and trees of the region and is so beautiful, that it alone would be a reason for me to hike that section again.